In addition to the Ribbon across the top of the SharePoint Designer screen, a navigation window occupies the left side of the screen. The Navigation window provides a quick display of the Site Settings page, lists and libraries, workflows, site pages, site assets, content types, site columns, external content types, data sources, Master Pages, page layouts, site groups, and subsites. In addition, the Navigation window offers an All Files view that shows you all the files in the site (which is similar to the behavior of SharePoint Designer 2007). 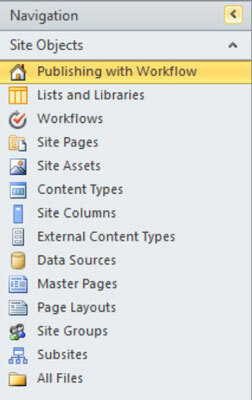 The page layouts navigational menu is only displayed if the site is a publishing site — a site that has the SharePoint Server Publishing Infrastructure feature activated. The Design section of SharePoint Designer is dynamic — what you’re working on provides the context that determines which commands are displayed. For example, the Design section displays everything from the settings screens to the editors to the Workflow Designer. The top of the Design section includes a navigational component similar to a web browser. The Design section’s navigational component includes a Home button and Forward and Back buttons to move through the history of windows that have been opened. For example, if you clicked the Settings page, opened an editor, and then clicked to a different list altogether, you can click the Back button to retrace your steps back through the various windows. In addition, a breadcrumb component (Hansel and Gretel, anyone?) shows the location of the current component in the overall hierarchy of the site. For example, if you’re editing the columns in a calendar list, you see a breadcrumb “trail” to show that the location is the site, the List and Libraries galleries, the calendar list, and then the editor. SharePoint Designer allows multiple design windows to be open at the same time — say, an editor, a gallery screen, and/or a settings page. Each window is represented by a tab. You can change the order in which the tabs are displayed across the screen by clicking them and dragging them either left or right. This is helpful when you want to see the tabs in a particular order as you work. For example, you may want to keep the tab that contains your style sheet always to the left of the tab that contains the page editor. The breadcrumb feature is also a handy way to navigate to a specific window in the same context as the window you’re viewing. For example, if you’re viewing the settings window of a page, you may want to do a quick click to the editor window for this page without having to move the cursor down to the Edit File link. You can see the available windows that you can move to from the current window by clicking the drop-down arrow on the rightmost breadcrumb.